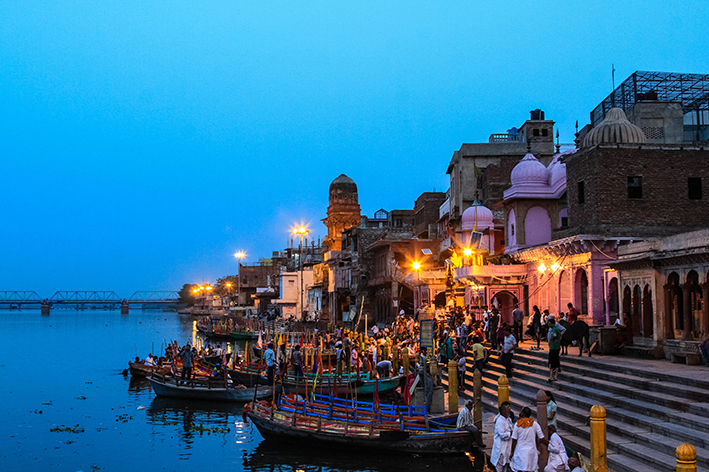 Stretched out along the Yamuna river lies Mathura. Like its neighbours Vrindavan, Govardhan and Barsana, it seems to be lulled by the sweet notes of Lord Krishna’s flute. After all, it is said to be the place where he was born. 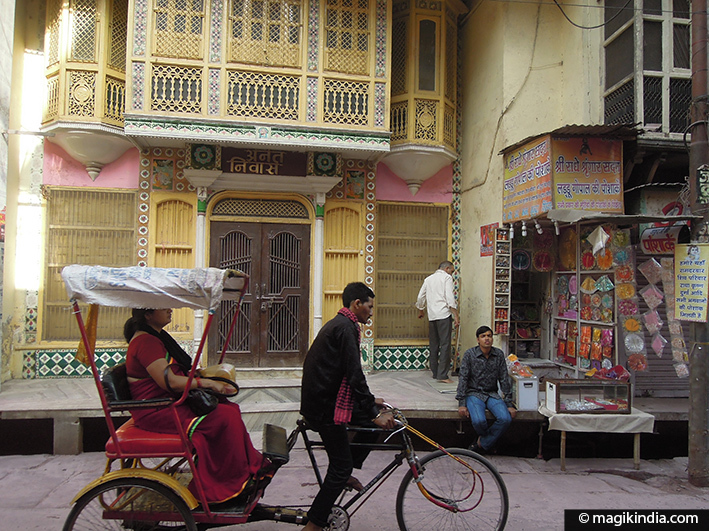 Mathura’s history goes back to early times. It is mentioned in the Ramayana, India’s oldest epic. The name is said to derive from Madhuvan (“the forest of Madhu”) because it was abundantly wooded. The town is also famous for its Buddhist art, which contributed to the first golden age of Indian art in the 1st-3rd centuries CE under the Kushan dynasty. 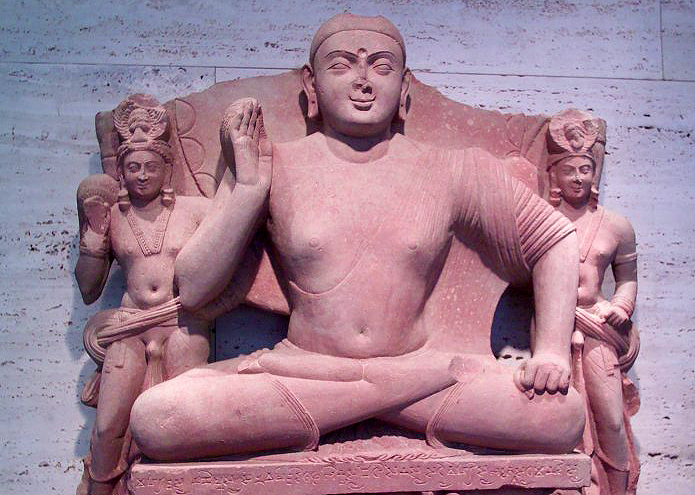 Its famous reddish sandstone sculptures were among the earliest representations of the Buddha as a human figure. This figurative revolution gave rise to a whole iconographic repertoire that is still evident in Buddhist art today. Like Varanasi, this important pilgrim centre is to be experienced rather than visited as for the atmosphere of sacredness it exudes. 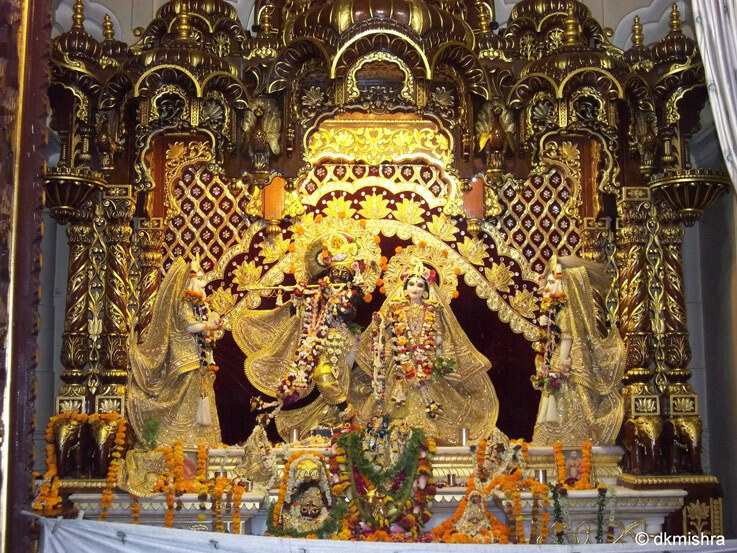 Mathura is certainly the best place to attend the Hindu festival of Krishna Jayanti or Krishna Janamashtami, which marks the birth of Lord Krishna…. 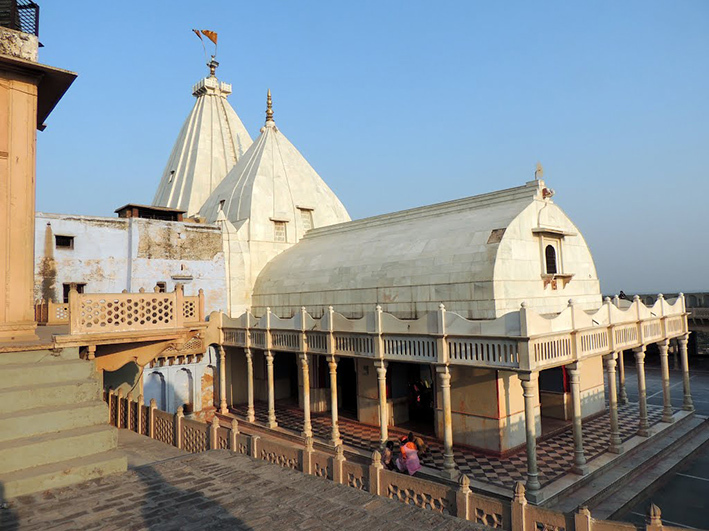 Krishna Janma Bhoomi is a place of prime importance for Hindu pilgrims to visit because this is where Lord Krishna is supposed to have been born in a prison cell 5000 years ago, when his parents were imprisoned by King Kamsa. Garbh Griha (the Sanctum Sanitorium, the prison cell): the cell is reached through a long, dark tunnel. The atmosphere is particularly mysterious and silence is in order, though broken from time to time by devotees calling out “Hari Bol!” Then we reach a square, windowless room where Krishna is said to have been born on the bare stone. Keshavadeva or Kesava Deo temple: just by the Garbh Griha, after the mosque, is this temple dedicated to Keshav Dev, another form of Krishna. 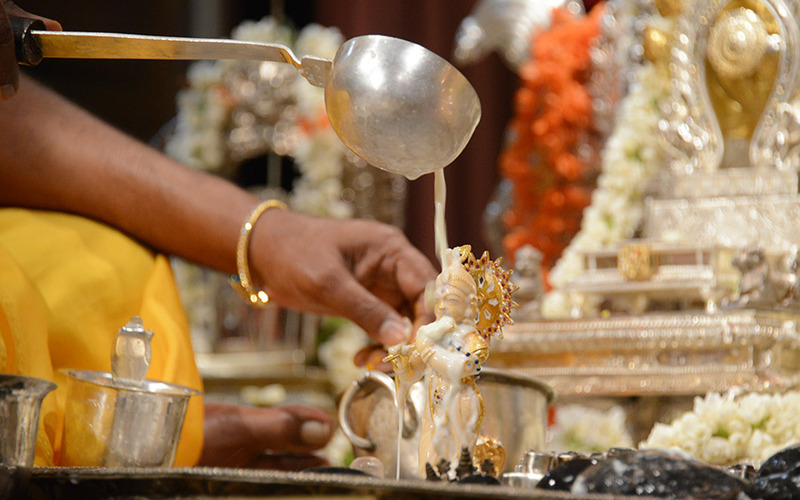 According to legend, the original deity was installed here by Krishna’s grandson Bajranabh. 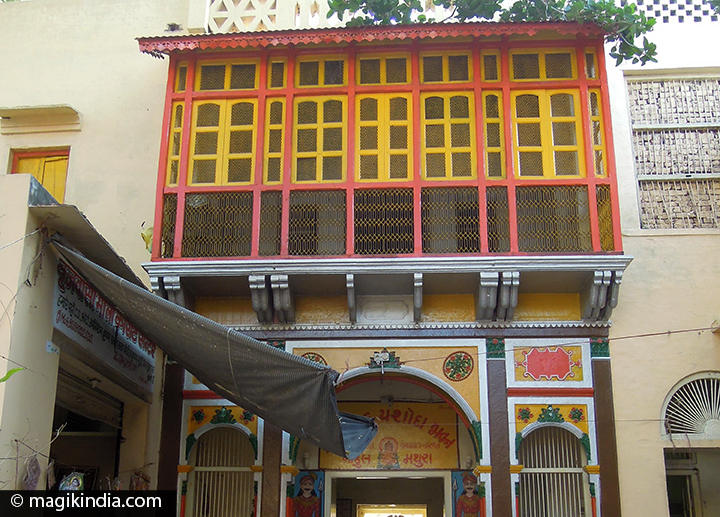 Bhagvata Bhavan: this comprises five temples, the main one being the Yugal Sarkar, which boasts fine statues of Radha and Krishna. 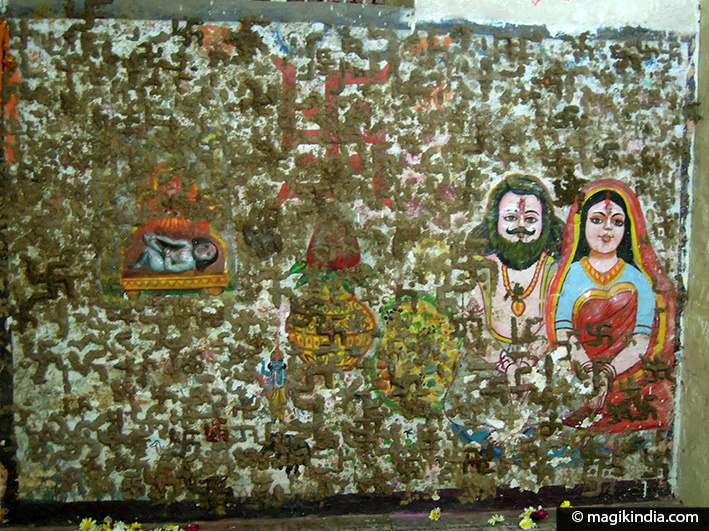 Another temple, this one to Keshveshwar (Shiva), features an unusual lingam made of mercury. It is said that a darshan (sight) of this lingam is worth darshan of all 12 Jyotir Lingams (Lingams of light). 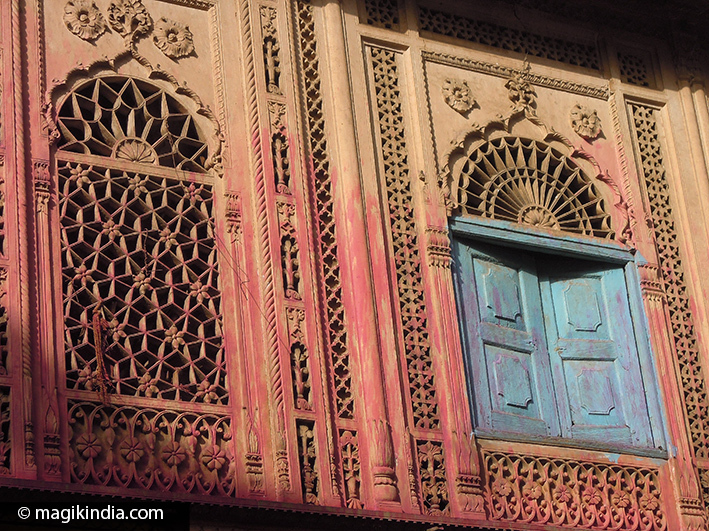 This complex also includes a mosque, the Jama Masjid, built in 1661 during the Mughal period. It backs onto the Garbh Griha. 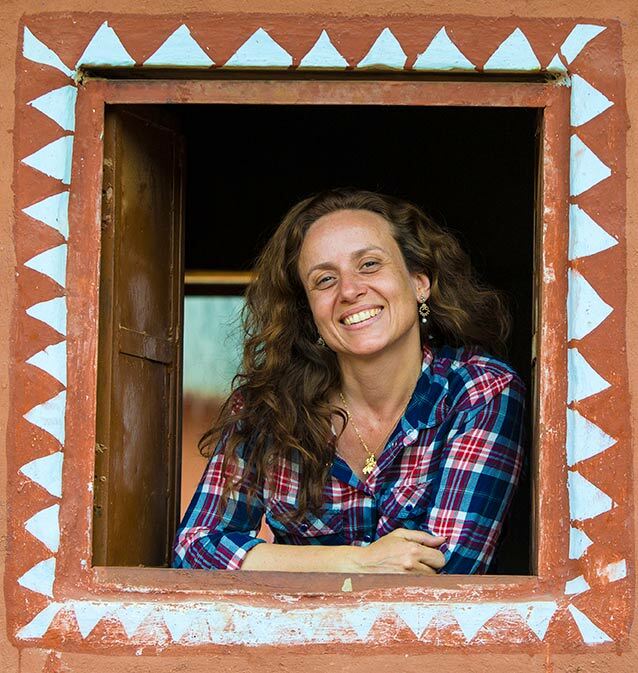 I recommend taking a guide to see the complex, for the very good reason that it will save you the interminable queue at the entrance, and you will also glean some precious information about the temples. At the exit to Krishna Janma Bhoomi is a large tank or kund where Krishna’s baby clothes are supposed to have been washed. 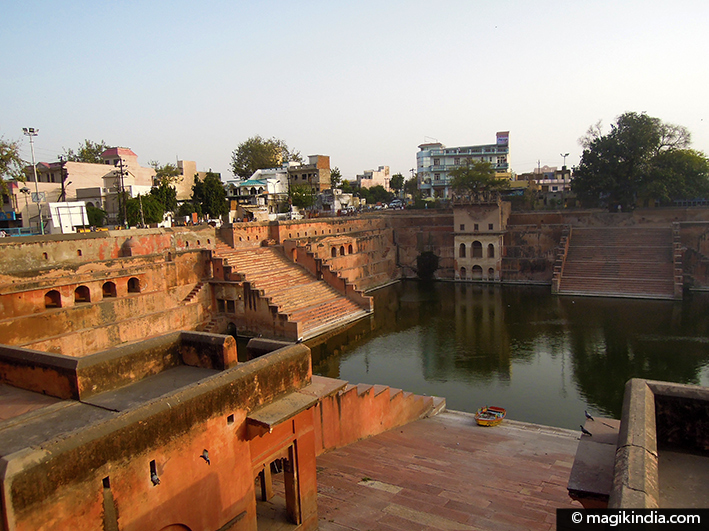 It is in fact one of India’s oldest kunds. 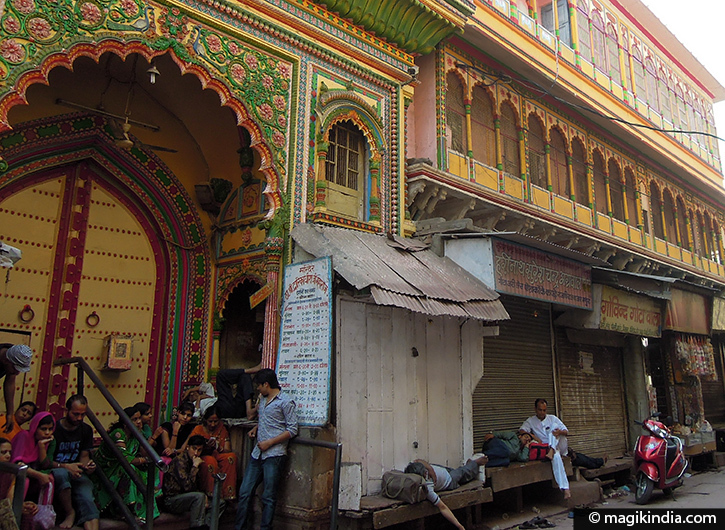 This colourful ghat is the most important of Mathura’s 25 ghats. 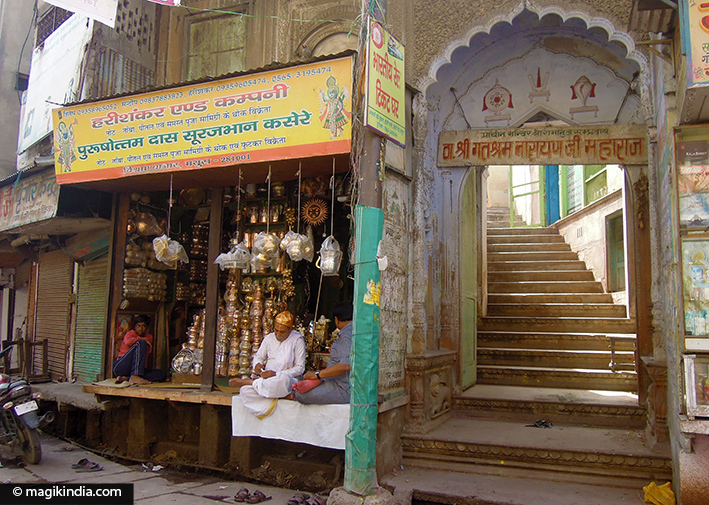 It is also the starting point for the Parikrama (circumambulation) of Mathura’s temples and other spiritual places. Legend has it that Krishna rested here after killing King Kamsa. An arati (flame offering) is performed here at sunset, when people put small oil lamps to float on the water. 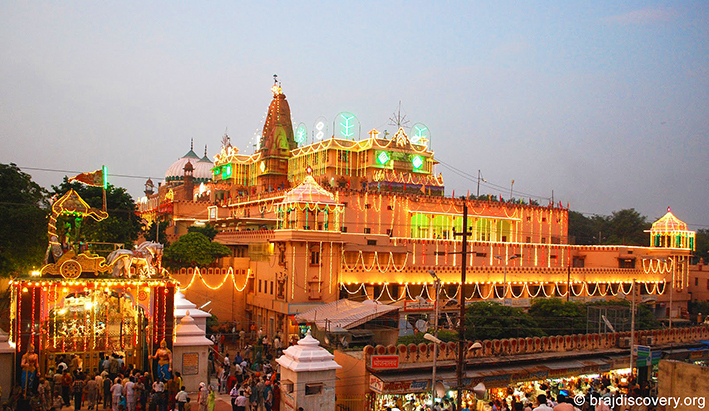 This temple with its colourful, finely carved façade, a few yards from Vishram Ghat, is one of the most holy in the town. Built in 1814 by Seth Gokul Das Parikh, a treasurer of the Gwalior kingdom, it houses statues of Krishna, Radha and other deities. 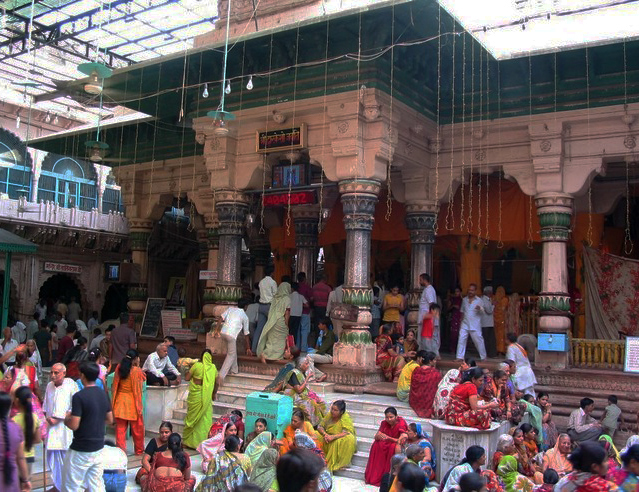 Dwarkadhish temple is now run by Vishnuite devotees of the Vallabhacharya community. The narrows streets where the Chowk, Dori, Naya and Chatta bazaars are clustered are a treasure chest. Stylish houses with finely carved fronts in wood or stone, equally elegant inner courtyards and doors of every shape and colour will amaze you at each corner you turn. Ambling leisurely through these streets is a feast for the eyes. 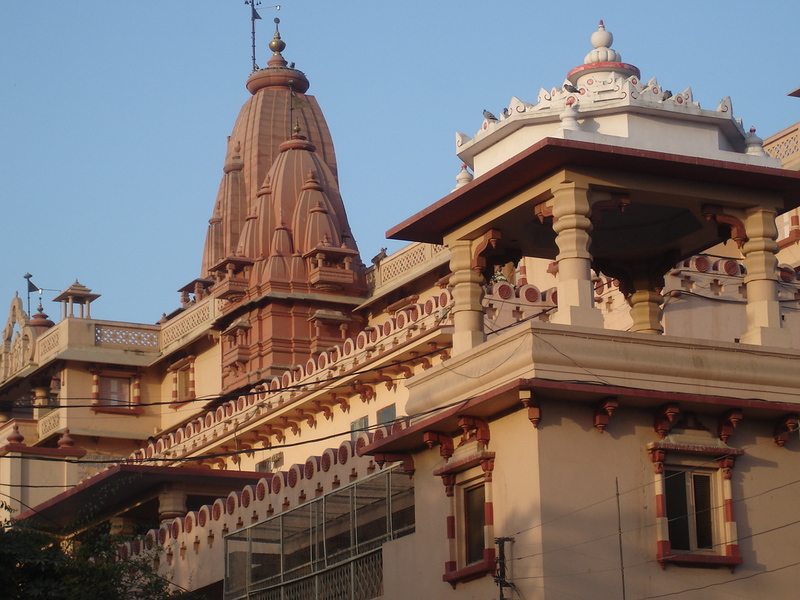 The museum houses artifacts pottery, sculptures, paintings, and coins primarily from in and around Mathura. 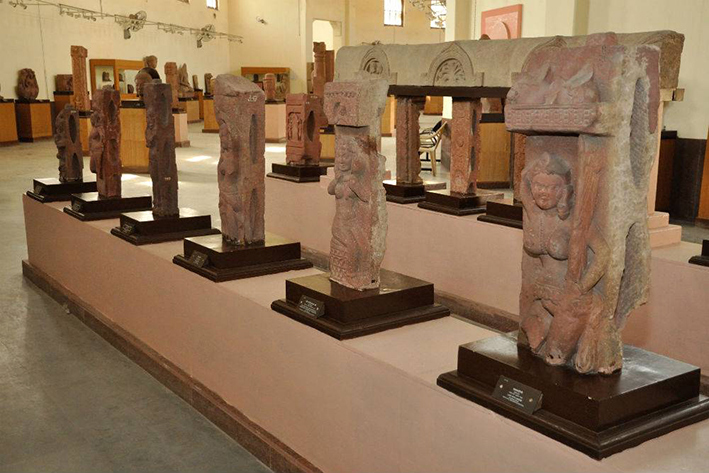 The museum is famous for ancient sculptures of the Mathura school dating from 3rd century BC to 12th century AD., during Kushan Empire and Gupta Empire. 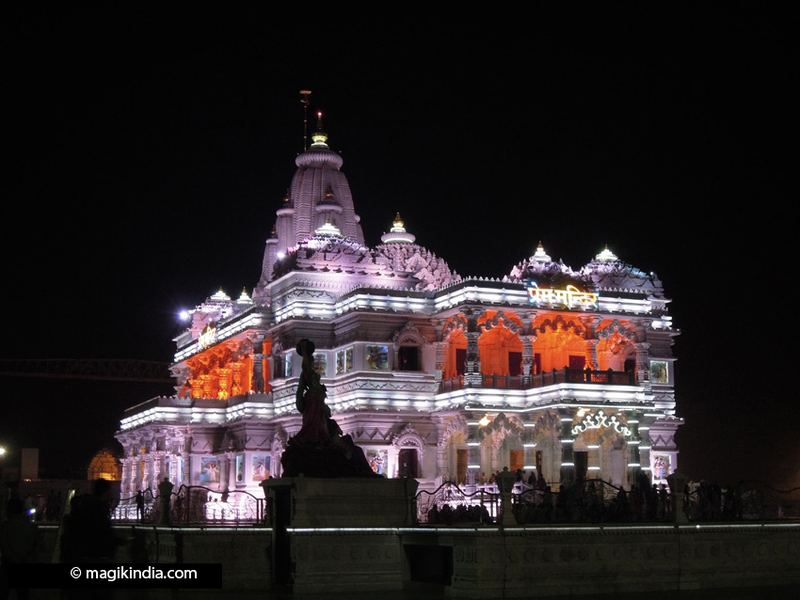 The town of Gokul, 16km from Mathura, is a must-visit because this is where you’ll find the Nanda Yashoda Bhavan, the house of Krishna’s stepfather Nanda. According to the legend this is where Nanda secretly brought the newborn Krishna, and where Krishna lived as an infant while his parents were imprisoned by Kamsa. Also worth seeing at Gokul are the Vitthainath and Gokulnath temples and the Shri Thakurani and Brahmaand ghats. 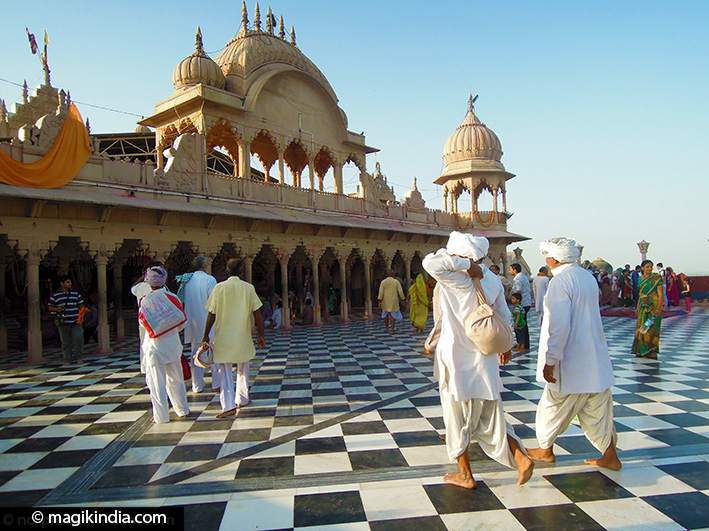 Nand Gaon is situated 50 Km on the north west of Mathura and it is also connected to the legend of Lord Krishna. This place is named after Krishna’s foster father Nanda and mother Yashoda who had their permanent residence built at this place after moving from Gokul. During his youth pastimes (from 7 to 10) Krishna lived in this village of Nandgaon along with his foster parents. It’s believed that after the disturbances created by the demons sent by Kansa to kill Krishna, Nanda left Gokul and shifted to Nandgaon after staying for some time at Chhatikara, Dig and Kamyavan. 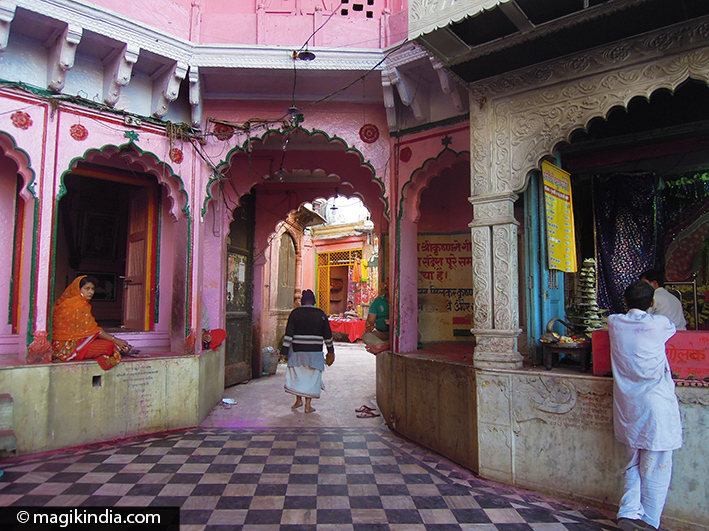 This Village of Nandgaon is located on the top of Nandishwar hill. 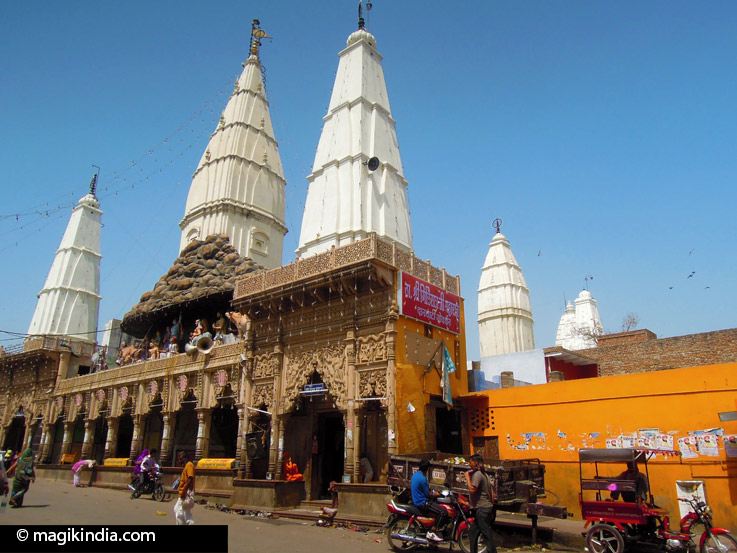 There are quite a few temples in the village but Nanda Rai is the main one built during the mid 12th century by the king Roop. It is said to have been built where Nanda had his house. This is the only temple that has the deities of Nanda’s whole family – Yashoda Maiya, Nanda Maharaj, Krishna and Balaram and their friends. Close by is Pan Sarovar. This is actually a tank that has masonry ghats along its sides. 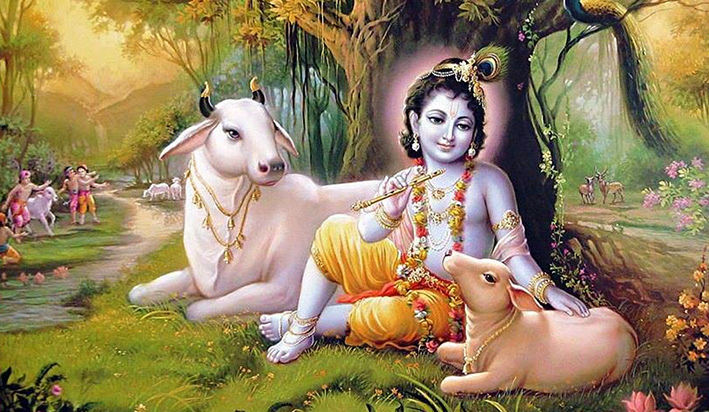 As per the legend, Lord Krishna used to visit these ghats with his cow.